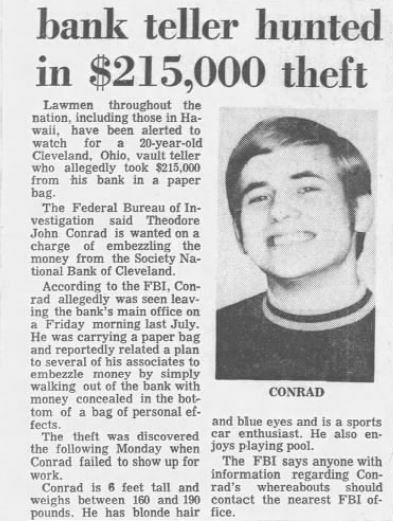 It was Ted Conrad’s 20th birthday and he was going to do it up right.He came back from his lunch break with a brown paper sack that contained a bottle of whiskey and a carton of cigarettes. He told anyone who’d listen about the big night he had planned. Ted worked at the Society National Bank. He was the vault teller. Ted was also a student at Cuyahoga Community College and had a girlfriend named Kathleen Einhouse. Friends described him as quiet and articulate. He had an IQ of 135. Ted’s favorite movie was The Thomas Crown Affair. The movie was about a millionaire who was bored with his life and decided to rob a bank for fun. This may have influenced Ted’s behavior on the afternoon of his 20th birthday. When the work day was over, Ted walked out of the bank with his brown paper sack in hand. The security officer didn’t check it, because everyone already knew what had been in it. On Monday, Ted didn’t show up for work. It was only then that the bank noticed that money was missing from the vault. Ted had walked out of the bank on Friday with a bag full of 50 and 100 dollar bills. $215,000 to be exact. Adjusted for inflation, that would be $1.3 million today. He left the bank, went home and packed a bag. He saw his landlady about 7:30pm and waved to her before he got in a taxi to the airport and called Kathleen. He told her that he was going to Pennsylvania to attend a concert. He was never seen by his friends or family again. Kathleen received 2 letters from Ted. The first letter came one week after the robbery. It was postmarked Washington D.C. The second was one week after that and came from Englewood, California. In both letters, Ted admitted to the crime. The following October, a couple claimed to have seen Conrad in Hawaii. They happened to be sitting near him at a hotel bar and the three began talking. When the couple told Ted that they were from Cleveland, he excused himself to the bathroom and never came back. When they returned home, they saw a news story about the bank robbery and reported their encounter to police. Authorities tapped the phones of Ted’s friends and family and even attended his high school reunions hoping that he would make contact. These efforts proved fruitless. In 1969, Ted was indicted for embezzlement and falsifying bank records. He could be facing about 20 years in prison. 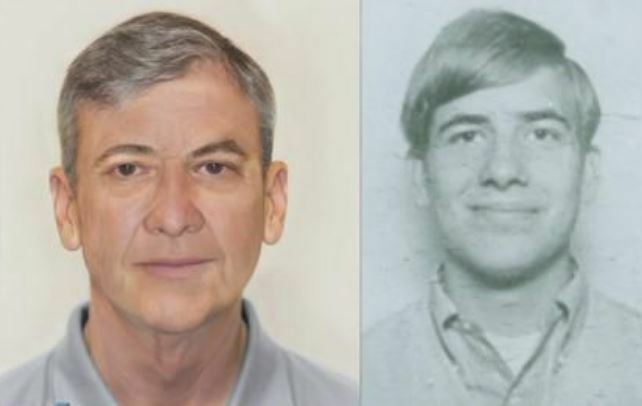 Police and the FBI believe that Ted is still alive. He may be married and have children that do not know about his past. The case is still open and active.